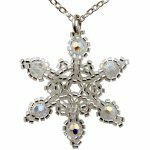 Need a quick little pendant to wear for that Christmas party, or need to make up some gifts this Christmas – this snowflake pendant is just the thing! Not only is it quick to make up, taking about 30 mins but looks so impressive! By using only 6 x 4mm Swarovski crystals it has all the all the sparkle you need! As usual with many ThreadABead featured patterns the pendant is suitable for even beginners to beading with 27 full colour photo instructions. This Snowflake pendant bead pattern is made using Japanese Miyuki size 11 Delica beads and peyote or brick stitch can be used. It is assumed the beader will be familiar with either Brick, Peyote or Both. Peyote and Brick stitch bead instructions are available free on www.threadabead.com. Please note the pattern may not work with any other size and type of beads. There is 1 delica colours in total and the finished snowflake is approximately 3.7cm x 3.7cm. 1 x 4mm Silver Plated Jump Ring, 1 x Silver Plated Trace Chain, 6 x 4mm Swarovski Crystal AB beads are also required. The bead pattern supplied is 10 pages and includes a colour chart of suggested delicas, a colour pattern and a numbered coloured pattern.